I would describe my artistic style as unique western art to wear. I am inspired by the beauty of the western land. The vivid Wyoming nighttime sky combined with the picturesque scenery of the west has manifested into artistic vision that transformed into the starburst constellation series in my Wild West Jewelry collection. I enjoy using precious and semi-precious stones. At the top of the Beartooth Mountains you'll find the only tundra in the lower 48 states. As Spring glistens on the watermelon glacier, the ice shines green and pink due to the algae trapped within the ice crystals. I started with a vision and allowed the piece to transform and take on a life of its own. I began beading about five years ago for family and friends. I was introduced to beading about five years ago by one of my daycare clients. She showed me some basic beading techniques and the rest has been self-taught. I found Fire Mountain Gems and Beads after a search for beads on Yahoo. I enjoy spending time with my family and pets. Jewelry-making is a part-time job. I have owned a daycare/preschool for the past ten years. 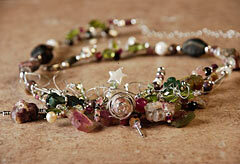 I find jewelry-making to be relaxing and it allows me to escape to a peaceful, rewarding state of mind. In attempt to market myself, over the past year I have had an ad in Cowboys and Indians magazine, attended the Denver trade show twice and have participated in two craft fairs. I also have my pieces in an art gallery in Arizona and three jewelry stores in Wyoming. I have donated five pieces to various charity fundraisers in my community during this past year. I would advise them to continue to grow and create their artistic visions through jewelry. View all of Emily's designs in the Gallery of Designs.